What Helen has done for years on television, she does now in her book, "Welcome to my Studio". Helen invites artists into her studio to acquaint them with the principles of painting. Helen's instruction is as clear as her art is beautiful. Truly a colorful, practical, fruitful "visit" for an oil painter. This is a comprehensive text for painters of all skill levels. Many photos in full-color of Helen�s own works, from initial sketches to completed paintings. 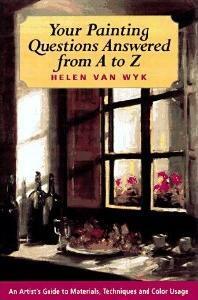 In the introduction to this book, Helen Van Wyk says, "Anyone can paint. It's true. You don't need talent or permission, just a desire to try". From this book's table of contents one can see the value of the instruction that has come from her many years as a painter and a teacher. Some of the chapters include: Making the subject fit the canvas. Reflections in water and other shiny surfaces. How to paint glass. The techniques of the Old Masters. These are but a few, of the many chapters in this valuable book. While it is true that "Anyone can paint", the instruction in "Welcome to My Studio" will help you to develope as a painter. 146 color illustrations. 90 b&w illustrations.